TARGET2-Securities (T2S) is the Eurosystem’s single platform for the settlement of securities transactions. T2S is meant for depositories so that they can provide their clients Delivery versus Payment (DVP) settlement services in central bank money using accounts at the central bank. T2S provides a settlement service, and depositories will maintain their contracts with clients and offer other services like registering and holding securities, and organising issues of securities. 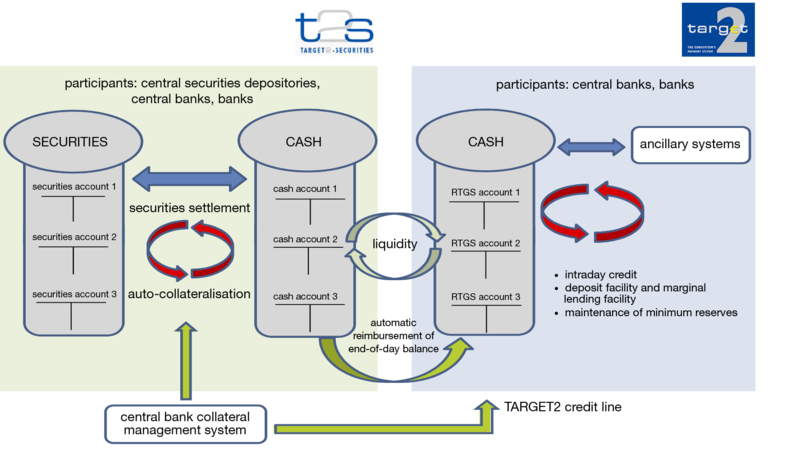 Securities accounts and T2S cash accounts are both on a single technical platform in T2S. T2S harmonises trading in securities in the euro area and makes cross-border settlement simpler, cheaper and more secure for investors. Depositories that have joined T2S make the securities registered with them available to all the other depositories on the T2S platform. This gives investors access to many more securities than before. The owners of T2S are the central banks of the euro area, including Eesti Pank. The platform was developed and is operated by the central banks of Germany, Spain, France and Italy. In addition to the euro, other currencies can also be added to the settlement currency in T2S, and the Danish krone was added to T2S in 2018. T2S started running in June 2015. The central securities depositories of Estonia, Latvia and Lithuania merged as a single entity, Nasdaq CSD, which joined the pan-European securities settlement platform T2S in September 2017. Read more about TARGET2 on the website of the European Central Bank . In 2009, Eesti Pank took the lead in setting up T2S EENUG, the Estonian National User Group, to promote cooperation between providers and users of securities settlement services and to support the development and introduction of T2S in Estonia. Members of the user group come from Eesti Pank, the Estonian Central Securities Depository, the Ministry of Finance, the Financial Supervision Authority and the commercial banks. Settlement of securities in T2S is done with central bank money in accounts opened in the central bank. One of Eesti Pank’s main roles in T2S is making the cash leg settlement of securities transactions and providing a range of technical support such as setting limits for market participants in T2S. To do this, Eesti Pank has to open cash accounts both for payment banks and for itself. Each cash account is linked to an account in TARGET2-Eesti.